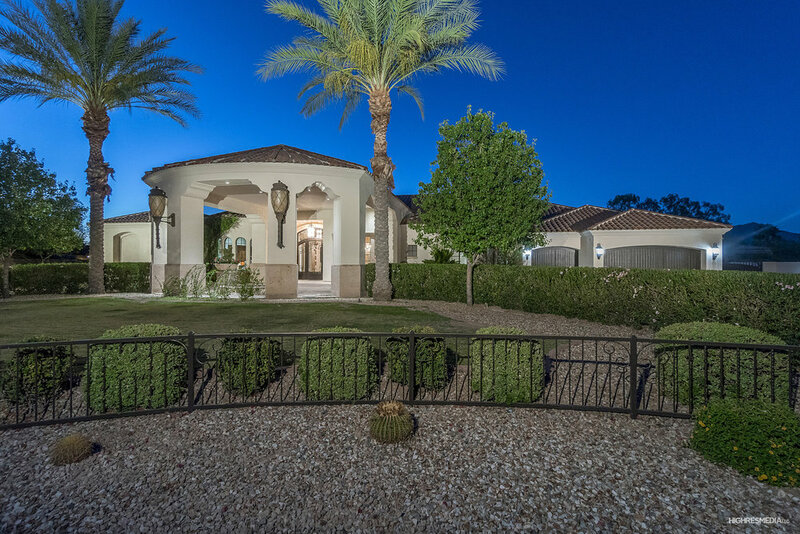 A rare find, this elegant estate in the popular Cactus Acres is on 1.1 acres of lushly landscaped grounds. The main home and separate guest home are adorned with finely selected finishes, hand-crafted cabinetry and doors, intricate ceiling details and a flowing plan with influences of modern Mediterranean architecture. A circular drive greets you with a water fountain and hand-forged iron and glass door that look through the formal living room's glass retractable wall to the resort backyard beyond. The formal dining room has an oval ceiling with crystal chandelier and looks into the 800+ temperature-controlled wine cellar through hand-carved wood arched windows. The great room is the heart of the home and is anchored by a Canterra fireplace, limestone floors with glass tile inlay,custom built media center and wet bar with copper sink, two refrigerators and glass front cabinetry with accent lighting. An African mahogany breakfast bar overlooks this WOW kitchen with large island and beautiful crafted cabinetry with generous storage, spice racks coffee bar. Top of the line appliances include multiple Sub-Zero refrigerator/freezers, Wolf 60" 6-burner range with two full ovens and warming drawer, and Bosch and Fisher-Paykel dishwashers. The walk-in pantry has plenty of storage and pull out drawers. The separate oval-shaped breakfast nook offers built-in seating with kid-friendly fabric and overlooks the outdoor patios. Ready to have some fun? Check out the game room with two automated glass pocket doors and the full bar including two refrigerators, ice maker and dishwasher. Plenty of storage, three TV's, an arcade and powder bath make this the perfect place for your next sporting event. When it's movie time, relax in the home theater with a large screen and projector, snack bar with microwave and two refrigerated drawers and powder bath, complete with mini TV, so you don't miss a thing. 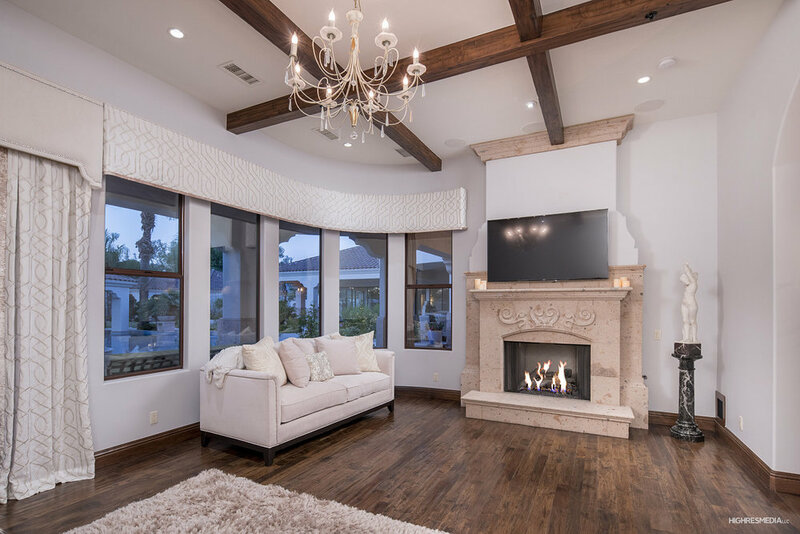 At the end of the day, relax in the master retreat with solid hardwood flooring, Canterra fireplace, wood beams and custom draperies. The spa bath includes a free-standing air jetted tub with back warmer and steam shower with rain head and body jets. The two large walk-in closets are perfect for those who love fashion and also has a second washer/dryer. Looking for large extra bedrooms? The en-suite guest room and two additional bedrooms are very spacious with walk-in closets and crown moulding. Let's get the party started! The entertainer's paradise outdoors is a treat for the eye. From the flames in the glass tile pool to the swim up bar, to the sport court, putting green or batting cage, there is truly something for everyone. Three fireplaces offer a variety of conversation settings and the fire pit perfect for your favorite s'mores. Travertine pavers flow into Canterra patios and the two outdoor kitchens offers plenty of space to cook up your favorite BBQ. Your guests will never want to leave the luxurious two bedroom, two bath guest house with family room surrounding a Canterra fireplace, breakfast area and kitchen with refrigerator, microwave and dishwasher. Are you a car enthusiast on top of it? You'll love the underground car vault, limo bay with service amenities such as dishwasher and ice maker, and car lift to accommodate your every whim. Come see for yourself!